Dr. Jain is a leader in the field of tumor biology – specifically in anti-angiogenic therapy, which looks at thwarting certain types of blood vessel formation. His seminal research demonstrated that anti-angiogenic therapy works by normalizing the abnormal, leaky blood vessels that usually surround and penetrate tumors. This therapy improves the delivery of chemotherapy drugs, increases the oxygen content of cancer cells and makes radiation treatments more effective. Dr. Jain has been studying the role angiogenesis plays in glioblastoma multiforme (GBM), the deadliest form of brain cancer. Dr. Jain’s research is helping doctors better tailor the use of anti-angiogenic therapies by identifying the characteristics that cause resistance to anti-angiogenic therapy for GBM patients. Dr. Jain and his team have identified molecular resistance pathways that may direct the development of new drugs that target these pathways and could extend the benefits of anti-angiogenic therapies for patients. Because GBM invades healthy tissues near the tumor, Dr. Jain is currently testing inhibitors that could prevent invasion. Vessel co-option is a process by which cancer cells migrate through and around nearby healthy tissue. Dr. Jain is identifying genes and pathways that facilitate vessel co-option in order to prevent invasion and improve GBM therapies. Rakesh Jain, Ph.D., moved from his home in India to the United States in 1972 after receiving a B. Tech in Chemical Engineering from the Indian Institute of Technology. He then attended the University of Delaware, where he completed a M.S. and Ph.D. in chemical engineering. Dr. Jain served on the faculty of Columbia University for two years and spent 14 years at Carnegie Mellon University. Since 1991, Dr. Jain has been the Andrew Werk Cook Professor of Tumor Biology and the Director of the Edwin L. Steele Laboratory for Tumor Biology at Massachusetts General Hospital. 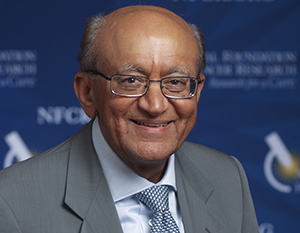 In addition to his fellowship with NFCR, Dr. Jain has appointments with the National Academy of Sciences, the National Academy of Engineering and the National Academy of Medicine. He is the ninth person ever to be elected to all three U.S. National Academies. Throughout his career, Dr. Jain has also been the recipient of numerous prestigious awards, including the 2012 Science of Oncology Award from the Society of Clinical Oncology and the 2016 National Medal of Science from President of the United States Barack Obama. He received the Medal of Science for developing new ways to manipulate tumors. Dr. Jain has mentored more than 200 doctoral and postdoctoral fellows in more than a dozen disciplines. He has also collaborated with hundreds of basic scientists in fundamental research and physicians across multiple specialties and the partnerships have resulted in more than 500 publications. Your ticket for the: Rakesh K. Jain, Ph.D.